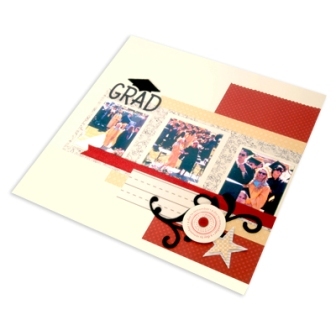 Celebrate the graduate's accomplishments with this graduation scrapbook page from Sizzix. This is a great place to display those cap and gown pictures. Find this craft and 17 other graduation crafts in our FREE Graduation Craft eBook. Create a scrapbook page out of colored cardstock and patterned paper. Mat photos on cardstock and adhere to page. Die-cut the phrase “Grad” from cardstock and adhere to page. Layer ribbon and a strip of patterned paper on the page. Die-cut Graduation Cap and Flourish from self-adhesive felt and attach to page. Stamp sentiment, crop using circle cutter, embellish with a button and adhere to page using foam dots. Die-cut Stars out of patterned paper, layer and adhere to page using foam dots.